With the Islanders having passed the halfway mark of the season, many hockey fans might not have expected to see New York three points out of the Eastern Conference playoff picture. Even though the Islanders have been inconsistent over their first 26 games of the season, they have shown an ability to play at a highly competitive level during certain stretches. While the Isles’ 11-12-3 record can only say so much about New York’s play throughout the first half of the season, there are some specific reasons that the team is still in the playoff hunt and not in the Eastern Conference cellar at the halfway point of the NHL season. In order to better understand how the team has performed up until this point, it might help to analyze some aspects of the team’s play on offense, defense, in goal, and elsewhere. 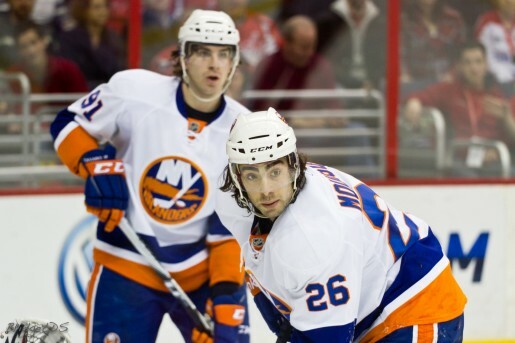 At certain points of the 2012-2013 NHL season, the New York Islanders’ offense has looked unstoppable. During other times? Not so much. Much like previous seasons, the Islanders have enjoyed waves of efficiency from their offense, but have also struggled to find their rhythm in a fair amount of contests. New York’s offensive woes have been magnified when the John Tavares – Matt Moulson line has hit some cold stretches, but the offense has been doing its job for the most part as the Isles have averaged three goals a game – good for ninth overall in the NHL. A slew of Islanders forwards have done a formidable job so far this season as Frans Nielsen, Michael Grabner, and Colin McDonald have provided New York with the secondary scoring that they were so sorely missing last season. Brad Boyes (5 Goals, 15 Assists) has turned out to be a great value find for Garth Snow after letting P.A Parenteau walk during the offseason, and John Tavares (16 Goals, 13 Assists) and Matt Moulson (11 Goals, 15 Assists) have been up to their usual antics. Josh Bailey (2 Goals, 3 Assists) missed the first ten games of the ’12-’13 NHL season, but he has looked more and more comfortable over the last several games. 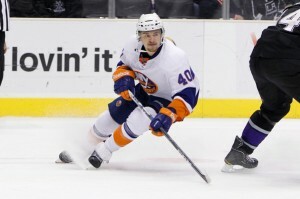 On the other hand, budding players such as Casey Cizikas and David Ullstrom have been a bit inconsistent for New York, but that should have been expected as the forwards continue to adjust to the NHL. While Cizikas and Ullstrom have encountered their struggles, Islanders fans probably wouldn’t have imagined that Kyle Okposo (2 Goals, 7 Assists) would be battling as hard as he has in order to get into some type of offensive groove this season. Okposo has looked better as of late, and the forward has been known as a slow starter and streaky scorer, but the Islanders could definitely use some more production out of Okposo as they go continue to fight for a playoff spot. Overall, the Islanders’ offense has kept the team in many games and has allowed them to win against some respectable opponents, but if New York has hopes of making the playoffs, then the team must receive some more consistent secondary scoring from its forwards. Martinek have stepped up in Strait’s absence and have actually helped New York win several key games over the last two weeks through determined play. Lubomir Visnovsky and Mark Streit have held up their end of the bargain by jumping into the offense for the Islanders, but New York has been prone to defensive lapses that have hindered the team’s ability to stay in certain games. Travis Hamonic and Andrew MacDonald have registered the worst +/- (-11 each) of any defensemen on the Isles’ current roster and haven’t looked like the dependable blueliners of years past at certain points of the season. 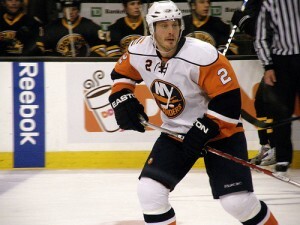 Brian Strait was by far New York’s best defensive defenseman up until he got hurt, but the Islanders will have to persevere without the rearback for what looks like the remainder of the regular season. Defense has clearly been an issue for the Islanders this season, and since it has prevented the team from taking the next step toward being a competitor, the grade given below cannot be any higher at this time. Evgeni Nabokov might not have the best stats at this point of the season as his Save Percentage is in the low .900s and his GAA is not too far away from 3.00, but that should not lead people to believe that the goalie hasn’t performed up to standard thus far. While Nabokov might not have the prettiest numbers for a starting goaltender, his 11-8-3 record has kept the Isles afloat in the Eastern Conference, and there have been quite a few games when the veteran goalie has had to stand on his head in the face of bad defensive play. 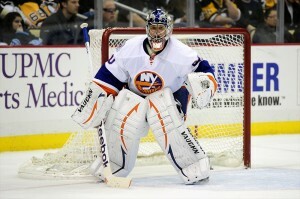 Rick DiPietro didn’t provide much help for New York in his four games played, but his relegation to the AHL opened up a spot for Kevin Poulin on the Islanders’ roster. Poulin hasn’t played much since being recalled from the Bridgeport Sound Tigers, so it would be extremely hard to judge the young netminder based on such a miniscule sample size. Of course, one can argue that Evgeni Nabokov has been prone to giving up some soft goals here and there, but there have been more than enough times when the goalie has bailed the team out with spectacular play. Seeing as how New York’s goaltending hasn’t really held the team back from competing, it would be hard to place blame on the team’s situation between the pipes, despite what statistics might indicate is going on on the surface. New York’s powerplay and penalty killing units have been a pleasant surprise for Islanders fans as special teams play has enabled the team to steal points in certain games. The Islanders’ penalty kill might be middle of the pack (thirteenth), but their powerplay is currently ranked fifth in the NHL. Mark Streit, Lubomir Visnovsky, Frans Nielsen, Brad Boyes, John Tavares, and Matt Moulson have been the essential components of New York’s powerplay and have been giving the team an added boost when it comes to play on the man-advantage. On the other hand, the Isles’ penalty killers have been solid for the majority of the season – something that makes one wonder why the team has played so poorly defensively when at even strength. Doug Weight has done a masterful job with New York’s powerplay this season and seemingly has an endless arsenal of plays for the man-advantage, but it will be up to the Islanders to maintain their special teams play so that they can keep pace in the Eastern Conference. 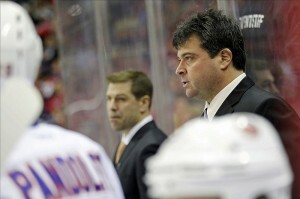 Evaluating New York’s coaching might be a bit trickier than it seems as the Islanders have been somewhat of a Jekyll and Hyde team. There are certain nights where it is clearly visible that the Islanders are not coming out with their skating legs under them, and a lack of motivation shouldn’t fall squarely on the players. Jack Capuano has offered some cryptic postgame conferences and answers when asked why his team hasn’t been able to sustain a level of consistency, but the coach has rallied his troops at certain points of the season and has also protected the Islanders players by not throwing anyone under the bus. Doug Weight and Brent Thompson have shown emotion when needed to, and the two assistant coaches have done a good job on the Isles’ bench. If not for Doug Weight’s management of New York’s powerplay unit, the team might just be a bit further down in the standings. The jury will probably be out on New York’s coaching staff for the remainder of the season, but it remains to be seen what Jack Capuano and his staff can make of the lockout-shortened season. After taking an average of the five grades given to the New York Islanders above, the team wound up with an overall average grade that equated to a B-. As always, there is room for improvement in certain areas, but New York’s most glaring problem lies with its defense. If the Islanders can somehow figure out a way to tighten up their defensive play, especially in their own zone, then the team has the potential to make a run for a playoff spot. Progress might be slow and steady, but the 2012-2013 New York Islanders have shown enough maturity to warrant a belief that the team could possibly challenge for playoff positioning.